At 18 pounds of butter consumed per capita, France is the world’s largest per capita consumer of the dairy product. This number is over double the European Union average and over triple the consumption in the United States. Despite the unparalleled demand, a recent Nielson report found that 30% of butter demand in French supermarkets wasn’t met between October 16th and October 22nd. The report also noted that shortages have been sporadic, peaking at 46% in some areas. What is particularly interesting about this shortage is that it is unique to France and no other countries are experiencing butter shortages. The underlying causes of the national butter deficiency can be traced back to a series of economic events and market forces that have occurred over the past few years. Supply Decrease: Over the past year both butter production and global supply has diminished. A major driver of this was the ending of the European Union’s milk quotas in 2015. Following the termination of these quotas, milk production skyrocketed throughout Europe culminating in a supply glut early last year that significantly drove down dairy prices. Dairy producers responded to depressed prices by cutting back production, which is contributing to today’s supply decrease. There are several other contributing factors to the decrease in production. Weather conditions led to poor yields in fodder crops throughout both France and the rest of the EU. Similarly, New Zealand, the world’s leading dairy exporter, experienced draughts throughout the year that caused their dairy exports to fall 11%. The United States has also stopped selling butter abroad in an effect to meet domestic demand. Demand Growth: While global supply has been decreasing, global demand has increased. Much of this can be attributed to shifting consumer preferences. Over the past few years butter, and animal fats in general, have had a negative image and unhealthy connotation. Today, public health sentiment has shifted its focus to sugar, helping butter to shed this negative reputation and return to many consumer households. In August of last year, fast food giant McDonald’s announced that it would no longer be using liquid margarine in its recipes, but would instead return to real butter. Interestingly, this announcement was coupled with the company announcing the removal of several types of sugars from various products. Asia, China in particular, has been a driver of the demand surge. Over the past few years, China has acquired a taste for western-style pastries, which require butter as a key ingredient. This has contributed to the more general surge in dairy consumption in Asia’s largest economy. Pricing: The reason why these shortages are confined to France is due to the rigidities in their supermarket pricing system. In France, supermarkets and their suppliers negotiate prices for goods annually. In the case of butter, prices were last negotiated nine months ago in February of 2016. This means that while butter prices nearly tripled in 2016, French prices have remained largely unchanged. With French supermarkets unwilling to budge on price producers have turned to foreign markets, primarily within the EU, where demand is plentiful and buyers are willing to pay the higher prices. Hoarding: A final condition that has exacerbated the effects of the previously mentioned trends is panic buying and hoarding. 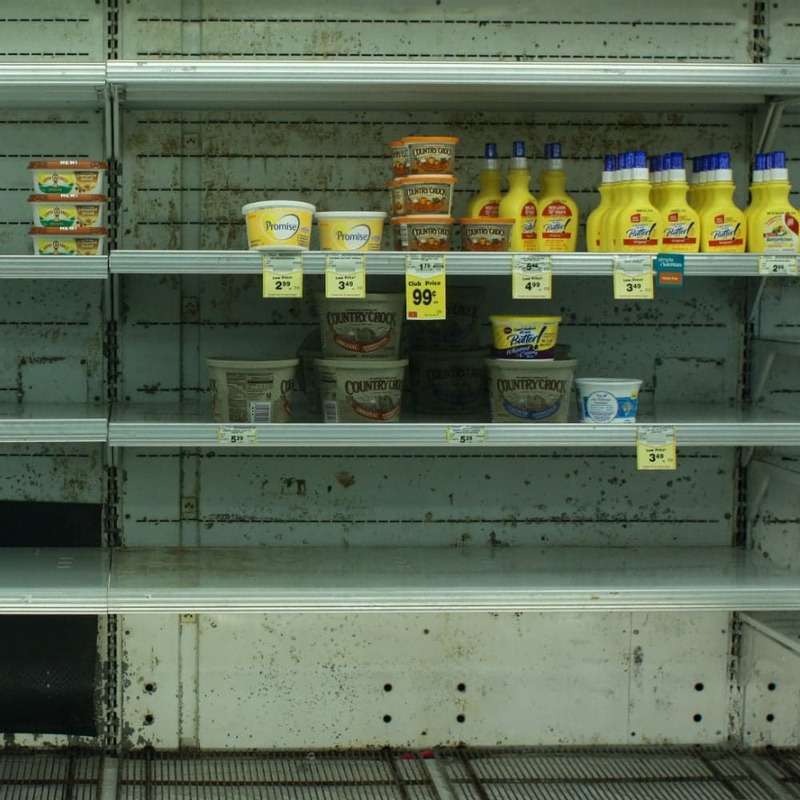 As the butter aisles at local supermarkets began looking increasingly sparse, many consumers have stocked up to ensure that they have a plentiful supply in the event of a prolonged shortage. In regard to the outlook of butter supply in France going forward, it seems unlikely that this will be a long-term issue. France’s Food Retailers’ Federation has downplayed the issues pinning the shortages on logistical problems linked to people hoarding butter. The butter shortages were also a topic of conversation in the French parliament last week where Agriculture Minister Stephane Tavert stated his hope that a deal between retailers and dairy producers could be reached soon. As a worst-case scenario, butter prices are set to be renegotiated in February so it is highly unlikely any shortages would persist past this point and it seems much more likely that a deal will be negotiated much sooner than that. In the coming weeks, however, French consumers may have to go without butter on their croissants.